These were the words of a desperate mother who was unsure whether or not they would live through a rocket barrage sent into southern Israel by Palestinian Islamic Jihad just one week ago. According to Noam Bedein, the director of the Sderot Media Center, for the last 17 years, Sderot and other Gaza border communities have been under rocket and mortar fire from Gaza. Starting in 2001, in the midst of the Second Intifada, Islamic militant groups from Gaza shot 3,000 rockets into Israel until the disengagement from Gaza in 2005. But after the disengagement from the Strip, the situation worsened with over 25,000 rockets having been shot towards southern Israel. The most recent flare-up was just over a week ago, when at least 40 rockets were shot into southern Israel over the Shabbat period. While on a tour of the south last week, Tazpit Press Service bore witness to the pain, struggles and resilience families in the south are facing as tensions mount. 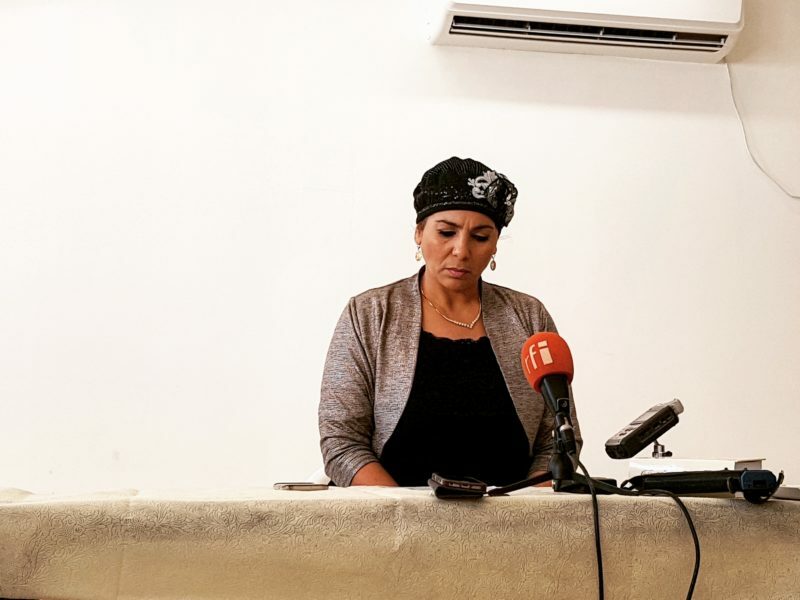 “I am a mother of seven and I am speaking out as a mother who has decided that I will no longer stay quiet,” Asulin continued, clearly emotional. “The world is not hearing what is happening in the south, I am crying out, we are at war with Iran and radical Islam – I am on the frontlines. “As a mother I am demanding a response a response – to wipe out those who are trying to kill us. Our children have been faced with attempted murder for nearly two decades. We will speak up until we have a voice in the world,” Asulin said. She said that last Friday’s rocket attacks had destabilized her and her family. “I’m in physical pain from the shock,” she said. “But I have to keep on working, I have no other choice. “The South is being treated as Israel’s backyard, there is a real indifference that’s developed toward us,” she added, saying that the government has a duty “to protect all of its citizens – I demand this. We cannot just go back to normal, there’s no going back anymore. Bedein explained that around 94 percent of children in the south are suffering from PTSD. The resilience center in Sderot is teaching children and parents methods of coping, as well as teaching children songs and games to cope with the continued low-density terrorism. “Every person [in the South] has a story,” he said. “A mother was telling me that one day while she was driving, a siren went off and she was faced with a dilemma: which child do I protect first? “This is what parents and children are facing on a daily basis,” Bedein said. While visiting a playground in Sderot, which uses long fortified tubes decorated as caterpillars for children to shelter in during rocket sirens, Southern resident Ogenya Scholnik emphasized that life cannot carry on like this. As the tour headed towards the Gaza border, a haze of smoke could be seen along the horizon. What was believed to be an incendiary balloon fire burned close to the Erez crossing, however, it was on the Gazan side. Soldiers who were on patrol along the borderline commented that the wind was blowing towards Gaza and as a result not many balloons had come over. The Gaza border seemed quiet aside from the smoke haze caused by months of continued burning balloon fires, but low-and-behold, just a couple of kilometers away an incendiary balloon had landed and exploded a car at a Kibbutz located close to the northern Gaza border. The tour group also visited the village of Netiv Haasara, which sits on the northernmost tip of the Gaza border, with a clear view of buildings rising in the distance of the in Gazan city of Beit Lahia. He explained that they have about six seconds to get to a bomb shelter when mortars or rockets are fired as the village is not even a kilometer from the Gaza. “I am nervous, and nervous for my family but they are things to be afraid of everywhere – especially as a police officer. I am afraid of many things for my children. It must end and it’s very hard to continue like this especially for young children and young families, but it will end,” he added. The officer added that there was a waiting list for families to come to the village because it is such a popular place to live, despite being under constant fire. “Many people come here because this is a place where Israel needs us more now. This is where we are more needed and it’s another reason,” he said.